DCI provides full-service bank technology and processing solutions to the financial industry. Headquartered in Hutchinson, Kansas, DCI's advanced banking solutions include the iCore bank processing and management system, imaging, Internet banking, networking, teller automation, ATM/card services network, and backroom services. DCI wanted to implement storage for a server consolidation project to improve efficiency, disaster recovery, business continuity, and flexibility for delivering IT as a Service (ITaaS). 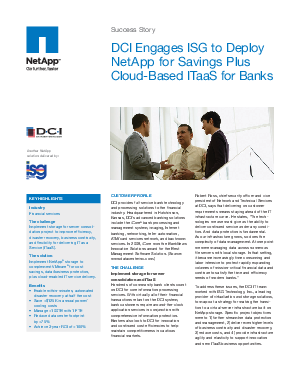 DCI implemented NetApp storage to complement VMware for cost savings, data/business protection, plus cloud-enabled IT service delivery.